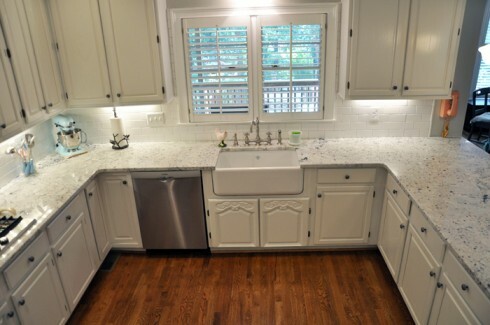 We’re pretty much done with the kitchen remodel on Stone House Lane! I’m going to show you those after pics and some before photos, but first I wanted to talk a little about my process, just in case you give a hoot! 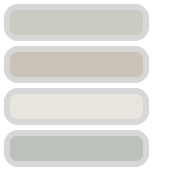 When I remodel or redecorate I first want to anchor all the decisions with choosing a style and my colors. All the other decisions come easier for me when I know where I’m going. 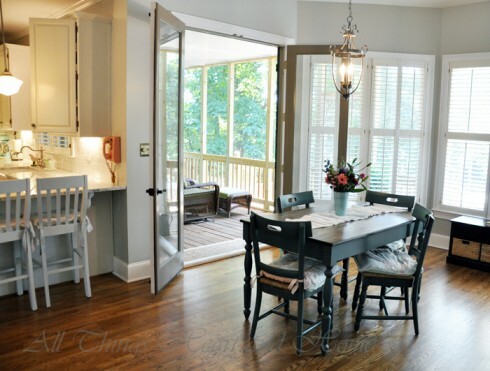 For the kitchen/breakfast room on Stone House Lane, I wanted a light, airy feel with a touch of rustic. 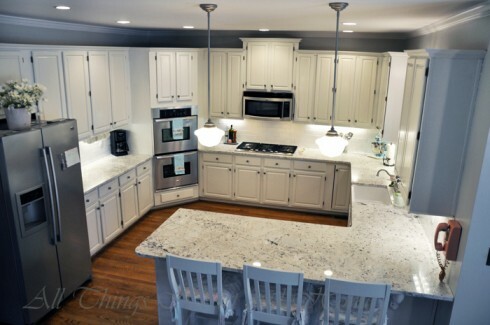 The specific color of the paint could easily wait until the counter top was chosen but in general I knew I wanted grays, blues and white under tones. The kitchen color, Dolphin Fin, turned out to be my favorite color of all the ones I used in the whole house! Okay…now the before and after pics! 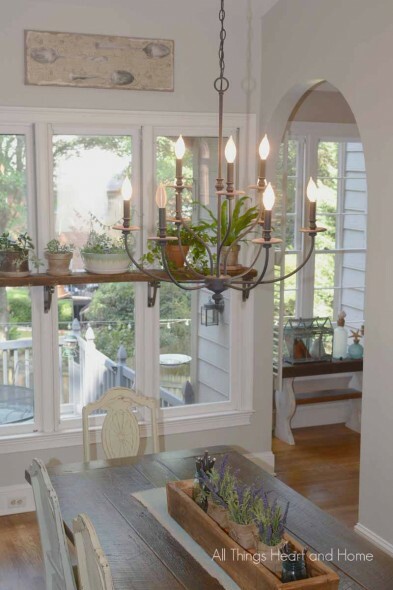 This photo is from the real estate website when the house was first on the market…It was a nice kitchen just not our style. 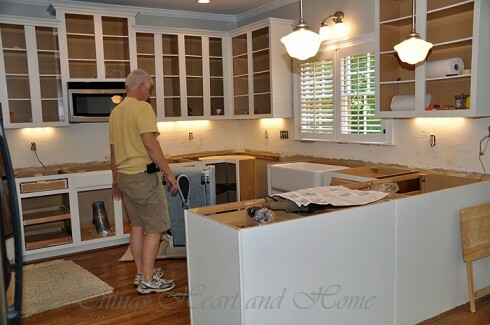 The cabinets were stained, the counter top was cream Corian, the backs plash was cream tile, the stove was electric, the sink was cream Corian, the dishwasher was from the 90’s, the light fixtures were bronze…all of that had to go. 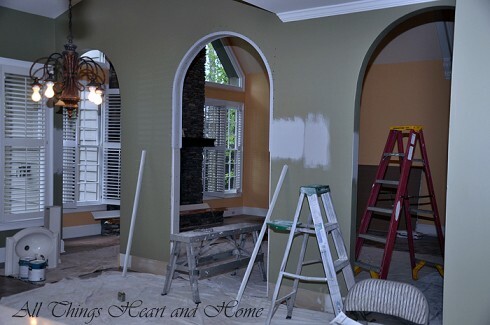 I primed and painted the frames of the cabinets (with the color Irish Mist which is not a bright white. It’s got an ever so slight silver/gray undertone). 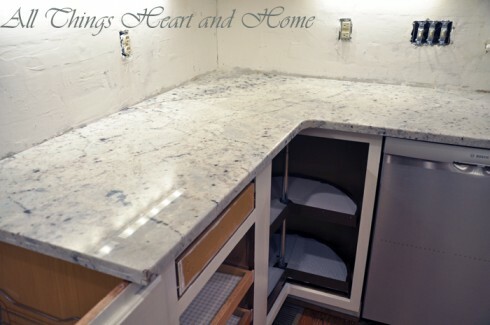 There are so many choices when remodeling a kitchen, but the hardest by far was the counter top surface. I posted about our dilemma HERE. 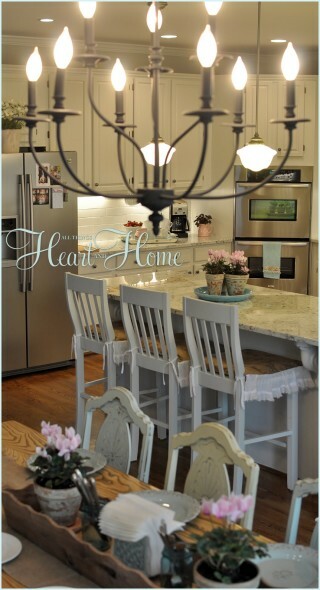 Other choices were easier..we both love the school house pendants for over the bar. Another thing The Husband insisted on was to have LED under cabinet lights wired by the electrician. I wasn’t sold on the idea, having them wired was expensive…but it made a huge difference and if I had it to do over, I’d gladly do it again. If you don’t want to have under cabinet lights wired, I would recommend getting plug-in under counter lights. The difference was significant. And when it’s cool enough outside, we open the doors to the screen porch which makes the space feel even more open. 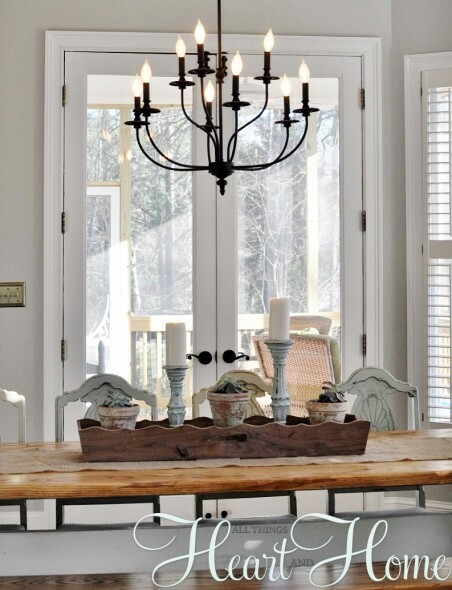 And here it is now with The Husband’s DIY Farm Table (HERE) & the new light fixture HERE! And HERE is the Breakfast Room after our latest little makeover! 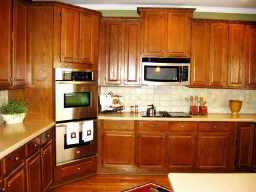 Remodeling a kitchen is kinda huge but really, any improvement you make to the kitchen, huge or tiny, gives you a big return. Whew…looking at the whole remodel makes me exhausted. I’m so happy that this part is done! Its gorgeous! Its soft and warm with features of old and new- its so YOU! Did you do the table as well? Love the entire transformation! Whew- you have got to be exhausted! Wow that looks fantastic! You made great choices for your kitchen. Love the colors and finishes. 🙂 Oh, I also like the way you mounted the TV in there. Robin, your kitchen is beautiful!!! You and Mike have so much creativity and style it is awesome!! I LOVE it…LOVE, LOVE, LOVE! You all did a great job! It’s such a dramatic difference – absolutely beautiful! I love the colors that you used. Very elegant. Can’t wait to show Ricky what his BFF has been up to! Robin, Robin, it’s just so incredibly gorgeous. And so YOU. Can’t begin to pick my favorite thing. 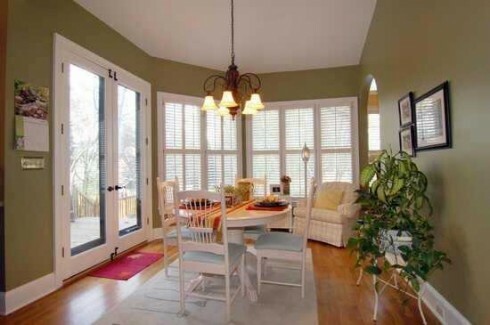 I love how the screen porch opens up to the kitchen. The Queen. The Queen. No way could you have ever left her behind! She belongs here. Love you, and one day, put on a pot of coffee and make us some GF cookies. I must absorb the atmosphere in person. This is just a lovely kitchen – I have always wanted an “all-white” kitchen and some day I would like it to look like yours! Robin, it is all gorgeous! Great job by you and The Husband. I know that was a lot of hard work, but a truly beautiful payoff. Love how it’s open and flows so people in one room aren’t totally cut off from people in the others. Love not feeling isolated when I’m working in the kitchen. I’m loving seeing all the progress on your new home. Much happiness to you and your family there! Beautiful transformation! Loving too how you opened up your adjacent spaces using the arches. P.S: Even though I do most of my own painting, I am planning on having them professionally done but do not want to be throwing away money unnecessarily. Also, as I don’t have a Blog, would appreciate if you could reply here. The grain did show through but I love it, I think it adds texture and personality! 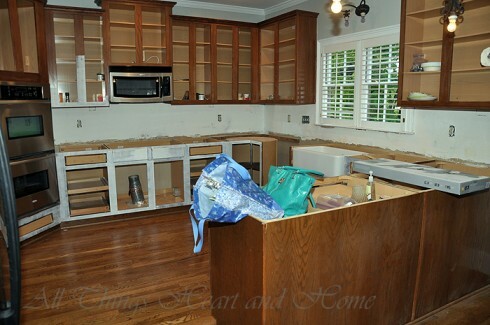 I love stained cabinets, however, when I saw this transformation, I am a convert! 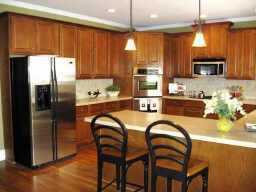 Your kitchen looks so much brighter and uplifting! Thank you for sharing with us! FABULOUS!! 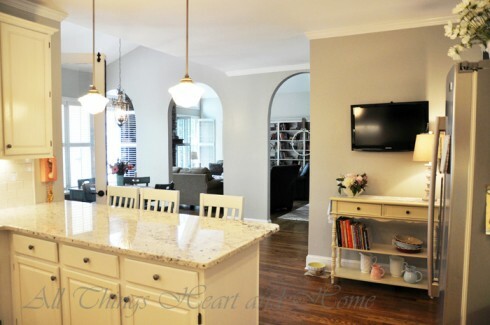 Your kitchen reveal is amazing, I totally love it and that grey is perfect! Everything is so well thought out, so I’m in love with it all. Love the archs by the den area, looks elegant. 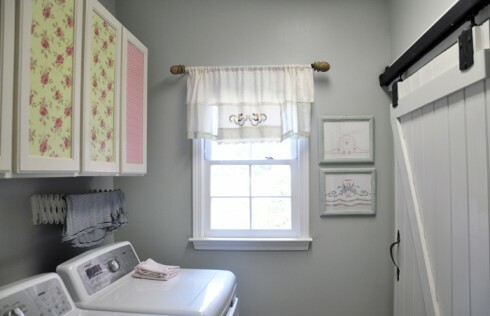 The utility room is adorable too! 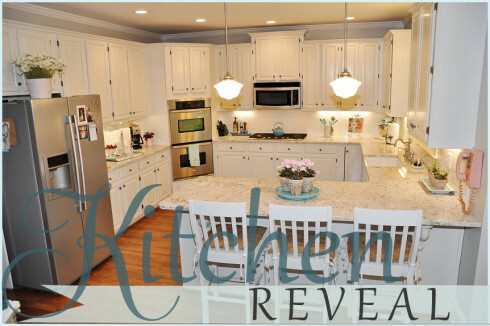 Hope you come and check my reveal…we did our kitchen 2 years ago. Have a terrific week. OMGeee! I love love love it! 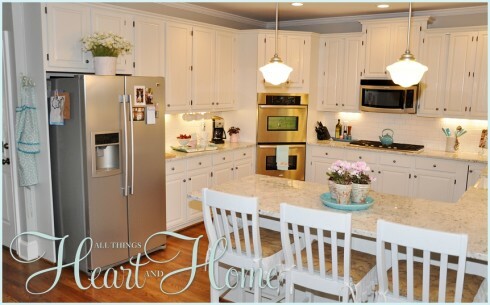 I have a white kitchen obsession and yours is one of my favorites! 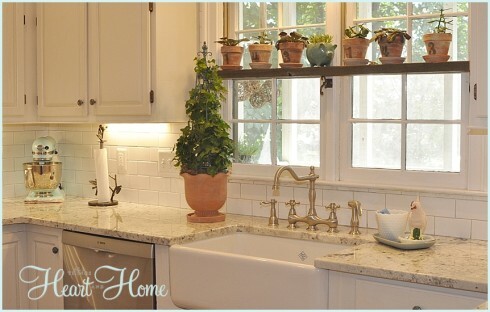 The farmhouse sink makes the whole space! Hi Robin, thank you so much for your prompt and detailed reply. Myself I usually use CIL paint and Zinners 1-2-3 Bullseye for priming, but will definitely keep the Behr products in mind as I really like the colours you chose. (Particularly the ‘Dolphin Fin’.) Wishing you a great day! what a fabulous transformation! 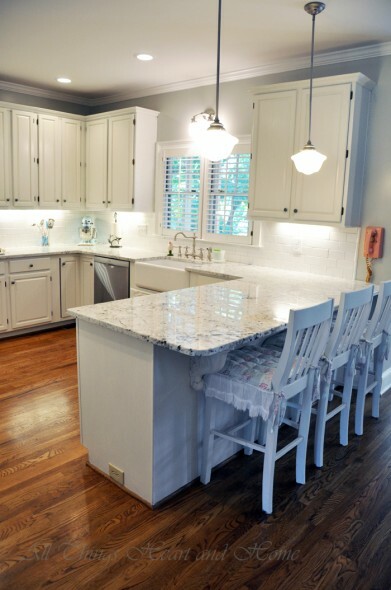 i love the white galaxy granite (totally writing that one down). fabulous! Wow that is gorgeous. I love all your choices. It is beautiful! Such a wonderful makeover. Bet you are proud and love using your new and beautiful spaces. 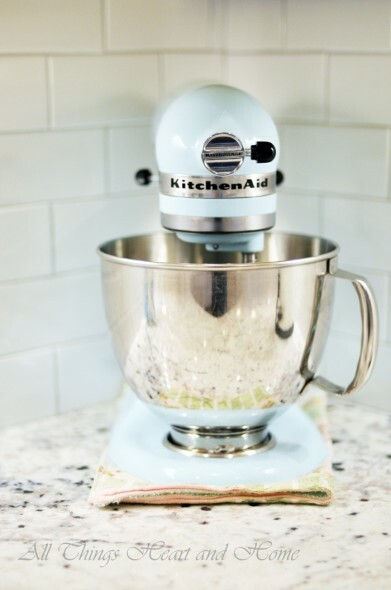 Your kitchen makeover is stunning! I love everything you did! I love having under-cabinet lights, glad you have those too. The three arches look better than one, almost as if it were designed to be three. But what I really wanted to say is I love the blog redesign! The headers are beautiful, and now I see where the colors came from! The total remodeling effort is beautiful! What a transformation! Your “new” spaces should give you much enjoyment for years to come. When we picked out our Kohler farmhouse, cast-iron sink, I didn’t even want to know the price! I about died when I saw the itemization and the unit price. If I had known the price, I wouldn’t have done it, LOL. But it is beautiful and I’m glad that we went with the splurge. We also have undercabinet lighting. We love having it, but have been disappointed at the frequency we have replaced the bulbs. My guess is that the builder’s electricians didn’t use gloves when putting in the lights and they have failed prematurely due to skin oils. Those light bulbs are expensive! I just love all your choices. The transformation is truly amazing. Very light, bright and inviting. I totally agree with the third arch. I would have wanted it open as well. I always feel like I am trapped in rooms that do not have open areas. In fact, we leave doors open for that reason. You did a great job and I was wondering how long did it take you? Samantha, We finished in about a month! Love your inspiration pics. Good luck surviving the renovation, I’m holding out on remodeling anything until the kids are a little older, I don’t think I could survive it! Robin, you said in your post that you had a gas line run for your gas stove top. Can you tell me how complicated that is to have done in a kitchen and was it a huge expense? One plumber I called didn’t even want to come out and look and told my hubby it’s a huge job/ expense, even though we have gas heat and water already to house… Thanks! We are getting ready to buy a house and remolded the kitchen, much in the same way you did yours! I’m wondering where you got your farm house sink and faucet? 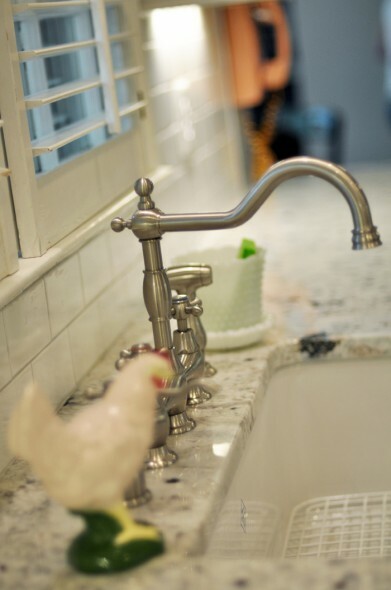 I’m obsessed with white farm house sinks and I love the faucet you chose on yours. 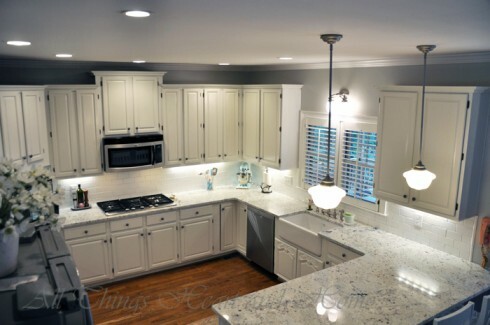 I’ve also been researching the whole marble/granite countertops, and I have to agree with you on the staining and wear of the marble, so I too will be going with the white granite option. Hi! I love your kitchen! I had to laugh because as I was reading your blog, I realized it seems we have a lot of the same issues and the same ideas. 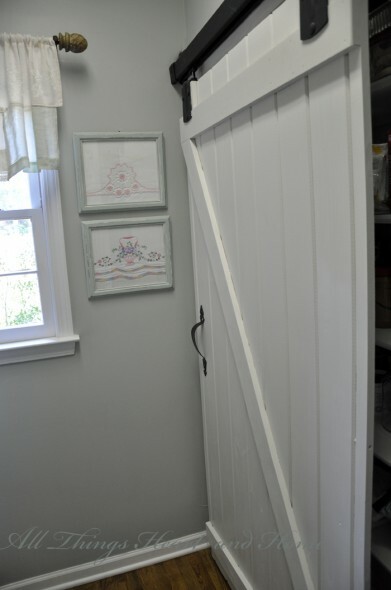 I have the barn door between the kitchen and laundry, my husband go this way on granite and we also got a farmhouse sink…although ours is stainless. I also have the same little room off the garage. Just kinda funny. Beautiful home!